The road that leads to Saalumarada Thimmakka’s home in Hulikal of Magadi taluk is as much a source of wonder as the destination itself. I wonder if the incredible beauty of life and its full meaning need such an encounter to shine through! There was a specific intent behind meeting Thimmakka. We had to officially hand over the “IGBC Green Champion” award plaque which she failed to collect at the event for personal reasons. As my friend and I drove up, we realised Thimmakka was a landmark herself. 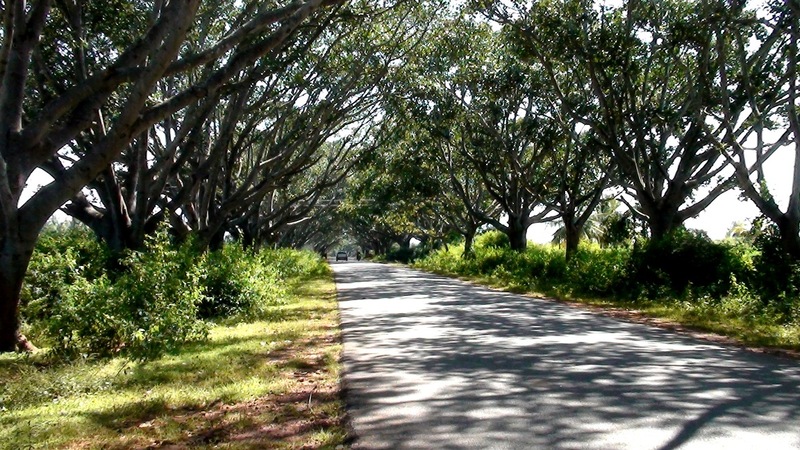 Hundreds of banyan trees on either side of a surprisingly well-laid road mutely acknowledge the physical hardship Thimmkka and her husband had to put up with to nurture them. Decades ago, she walked many miles carrying pitchers of water to nurture the plants. Summers were especially hard and unnerving. A house painted bright green has her name written on its compound wall and the epithet, “parisara premi” (lover of nature). It took little to realise that sometimes epithets fall miserably short as descriptive substitutes. Because this epithet (or any other, for that matter) does not tell us the selflessness with which she went about planting nearly 1000 trees, of which about 150 died. Nor does it tell us about the spiritual connection she continues to share with these massive trees aged 60-70 years. Thimmkka slowly emerged out of her house and stood in the front yard with her hands folded. Smilingly, she led us in and pointed at the showcase studded with a number of plaques and garlands and trophies and what not! She spoke candidly; giggled like a child. She explained how happiness invades her when she sees goats and cows munching on the banyan leaves and people resting by the roadside on hot summer afternoons. We emerged out of her home and started walking down the road. 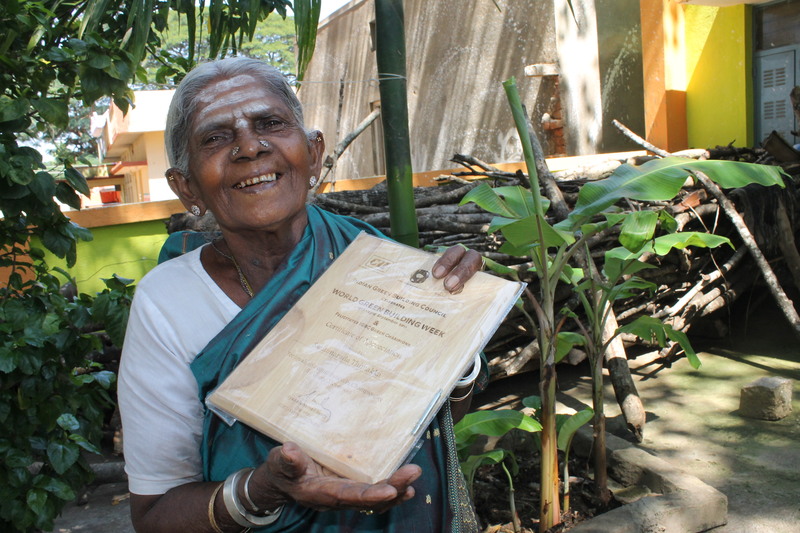 Thimmakka began talking about the trees all over again—her spiritual pilgrimage. She stood by a tree like a proud mother of 1000 children as her gnarled hands ran over the trunk. 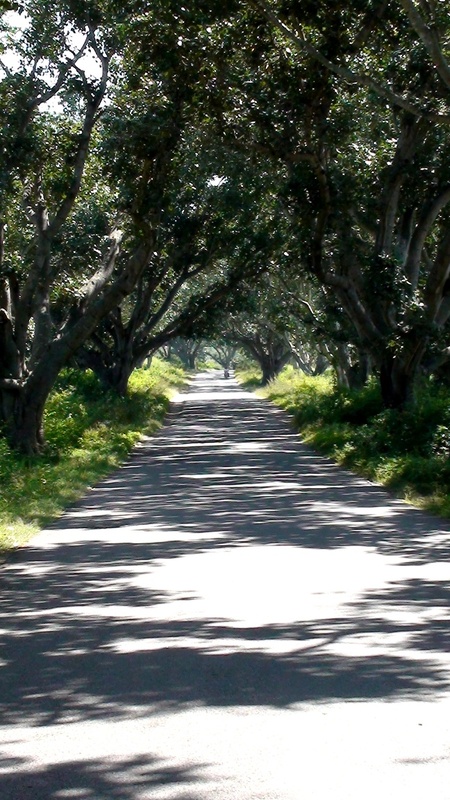 The thick canopy that leaves a beautiful dappled effect on the road runs at least four kilometres! It seems as if the tangled and whispering shadows are in an endless conversation with each other. The experience of walking on this road arcaded by these green giants is something to be savoured at least once in a lifetime. For it emerged out of a couple’s ability to reconcile their unfulfilled parental instincts with the importance of connecting with nature and finding a deeper meaning and purpose of life. For it is a collective history shared between an amazing woman and nearly 850 trees (going by her count) we are all so proud of. For it’s no less than a piece of art laid out for general viewing that need no critics to appreciate the truth of the matter. We took leave of Thimmakka as she stood waving at us—a small-built but determined woman whose home is the road itself. This entry was posted in Close Encounters, Endlessly Green and tagged Bangalore, Banyan, Hulikal of Magadi taluk, IGBC Green Champion, Magadi, Saalumarada Thimmakka. Bookmark the permalink. Did you get any relevant details Mr. Manjunath. If so please share with us. Thank you for your interest, Rupesh. I am trying to get Thimmakka’s son’s id. Will get back to you soon. nice to hear we must spread this news…. lets join our hand fr the same…. Me and a few of my friends are planning to meet salu maradha thimmakka. It would be great if you could help us!!! Just sent you a mail with contact details. Thanks. ASAP could you please send contact details to meet saalu marada thimakka. Appreciate your help. Hi, Have just mailed the details to you. please mail the contact details of Akka would like to meet her with my kids. thank you. Iam Parameshwar from Bangalore. Iam a Film maker. Thinking of making a Documentary film about “Salumarada Thimmakka”. Can you help me in this regard? My Earlier Documentary film Project link is below. Thanks for writing in. I am mailing you the contact details. can you please mail me her cntact address. Even though I am in Banglore since long time I am first time knowing about this great lady. Pls do, Mr Satyapal. She is a nice person to talk to. Who are all asking contact details of Saalumarada Thimmakka, You are requested to giv a cal to Mr. Umesh who is adopted son of Thimmakka ji., Since from 14 years he is living and taking care of her. He was inspired by Thimmakka ji and doing same job what she tells. Till date he has planted and conserved about 30000 plants. They have been planted in public school premises, Govt office premises, hiils and bunds. He was too awarded with number of state and National awards and he has a dream of planting 1 crore plants. Pls encourage him and give your valuable suggestions.